The best thing about going to book festivals is meeting other authors. 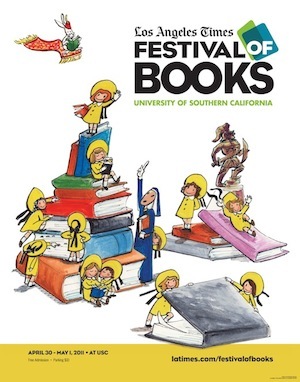 At the Los Angeles Times Book Festival over the weekend I met such folks as Mo Willems, Mark Teague, Garth Nix, Sam Irvin (author of a biography of Eloise creator Kay Thompson), and Rachel DeWoskin, the decidedly non-kids author of Foreign Babes in Beijing. But the one person I set out to meet was Tao Nyeu, whose books are one of the surest signs of a well-curated kids section. Such places are recognizable in an instant; the turned-out covers let you know that the bookseller wants to promote and celebrate the art of the children’s book rather than emphasize best-sellers and tired old “evergreen” classics. A printmaker, Tao works in a style that is a kind of neo-Nabism crossed with smooth-edged psychedelia. As an artist, what most impresses me about Tao is her use of the white space of the page. You feel the creation of the art, which perfectly suits Wonder Bear, a wordless book about creating worlds out of nothing. Wordless books are a notoriously hard sell in a read-aloud market, but they are perfect for a child Galatea’s age, where a story need be for steering purposes only, and the whole point is to get lost in the pictures and the characters. Gal’s favorites are the spider monkeys, who emerge as a gang out of Wonder Bear’s magical top hat in a scene that inverts the plot of Caps For Sale, another gloriously trippy book that Gal dearly loves. 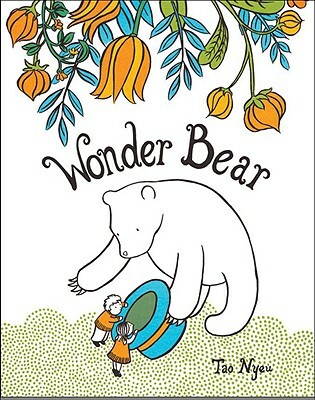 Wonder Bear and Spotty–which Gal now reads one after the other, back and forth–present a stark contrast between new and old, wordless and wordy, but both demonstrate that the essence of the picture book lies in images telling a tale, and that the fun of them lies in the interpretation.